Good filing systems not only save space, they improve productivity by allowing your staff to find important papers quickly. 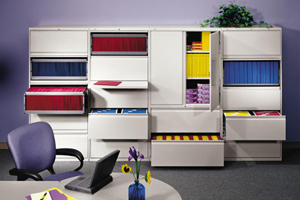 Workspace Solutions has hundreds of filing systems from under desk to room size. We also carry a huge stock of used filing systems in our warehouse. For more information on filing & storage solutions visit our Manufacturer pages below. 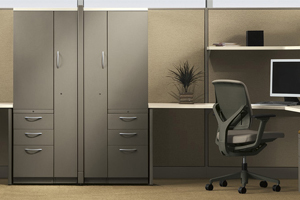 Allsteel offers a complete line of practical filing and storage solutions including lateral filing cabinets, pedestals, personal files, bookcases, overheads, and personal towers that meet almost any office storage need. Hon's top-of-the-line filing systems maximize storage capacity and provide the freedom of flexibility. Choose from their full line of versatile components to achieve the right balance of filing, storage and worksurfaces for your office. 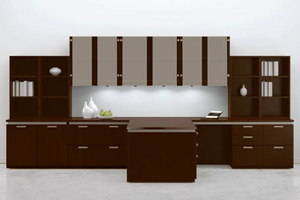 Adaptable laterals, storage towers, cabinets, pedestals and bookcases hold everything with style and durability. 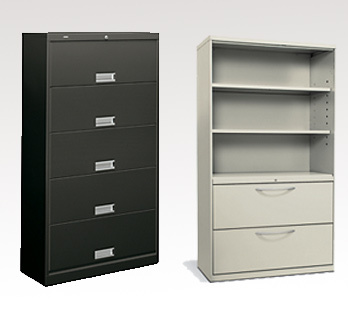 Keep your office neat and organized with a National office book case or office storage cabinet. National has a place for all your files and folders with one of their office filing cabinets, wood filing cabinets and vertical filing cabinets.